The Nautilus Hotel is the primary subject of this image. 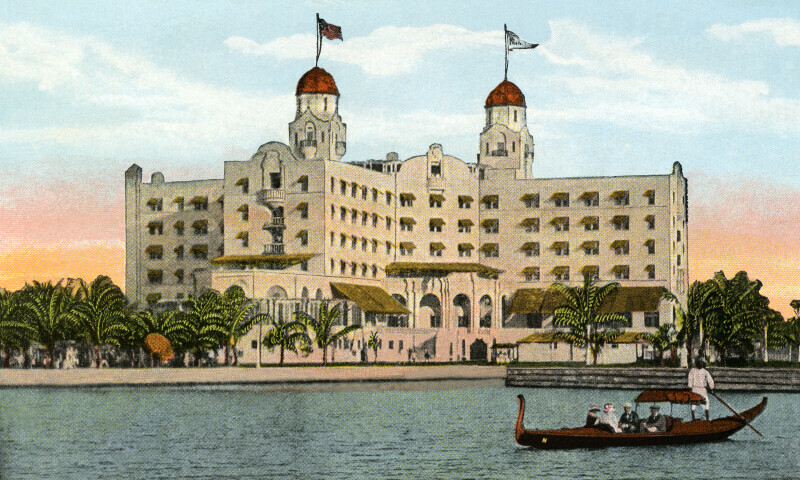 The hotel is a six story building, with two cupola-topped towers. The square towers have a balcony on each wall. In the foreground, there is a gondola, full of passengers, navigating the waters of Biscayne Bay. Many of the second floor windows are covered by awnings, and there is an arcade with five arches in the center. Above the second floor, all the rear facing windows have awnings. The grounds around the hotel are landscaped, and there are many palm trees.